There can be few more spell binding and 'heart in your mouth' exciting methods of catching carp than surface fishing for them. Intently watching our bait out on the surface, seeing a large dark shadow approaching it, suddenly followed by a mouth breaking the surface tension just in front of the hook and slurping in the bait - the line twitches immediately followed by a massive swirl of water and....Well, we'll leave the rest of the story for you to finish off. Here at home in the States, although carp can be spotted and sight fished for in some of the smaller lakes and ponds located around our suburban areas, upon first visiting many of our larger lakes, there seems to be few opportunities to see carp cruising the surface, never mind observing the larger, more mature, and experienced carp confidently feeding off of the surface. Of course, we see plenty crashing during our everyday sessions and although no-one is absolutely certain why, we feel that these fish are feeding below the surface of the water (although not always on the bottom of the lake!) and are just briefly crashing out of the water to clear their gill rakes of food particles or silt, or to adjust the amount of air in their swim bladders to effect ballast before swimming to deeper water or even to dislodge parasites etc. before returning to depths to continue feeding. The clearer the water is, the warier the carp are and consequently, much harder to locate during the hours of daylight. Their general avoidance of the surface layers in most cases here in the US is probably due to the prevalence of birds of prey in and around our lakes. However, the Carp on the Fly specialists among us often sight fish and catch tailing and Mudding carp in the shallows of even the largest of our lakes, so the opportunities are there. It's a fact, especially during the hot summer months that fishing with a bait on the bottom of the lake is often futile process. This can be for a multitude of reasons and these are often the times where surface fishing with one the following surface three rigs (shown in the diagrams below) even during the night time hours can save many a blank session. We have found that if enough time is spent just walking and watching our local lakes, looking hard enough, particularly during the early mornings and evenings, they can be seen especially in the warmer summer months. Like many aspects of successful Carp angling, it takes a little dedication and investment of time by the angler. In the right circumstances, there are fish to been seen in the upper layers. These fish, with a little effort and training can be taught to feed confidently up on the surface. 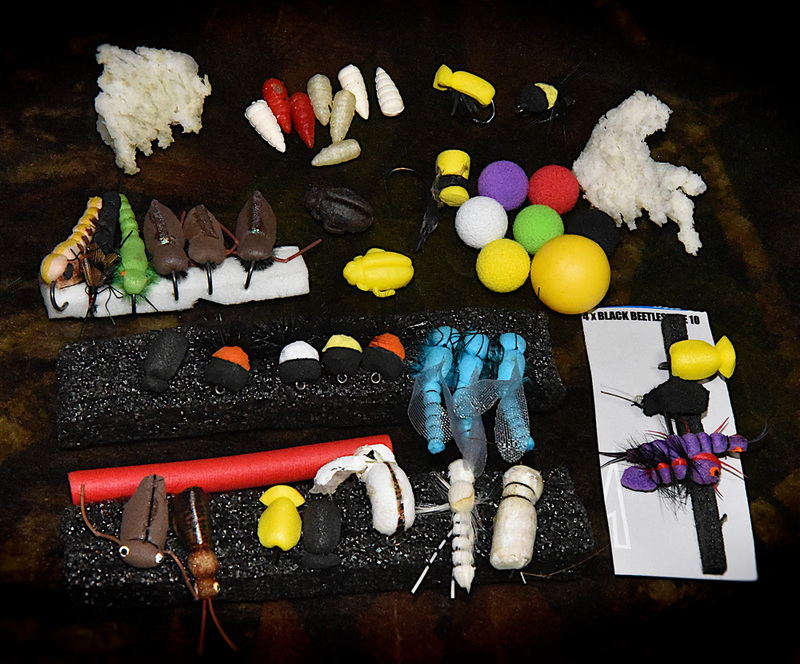 The slide show below shows many of the baits we can use to surface fish. Baits such as bread crusts, floating Koi or catfish pellets glued together to form a larger bait, some dry Dog and Cat food mixers that float will work well and of course, pop-up boilies, simple Rig Foam and floating Zig Bugs and the larger, buoyant dry Flies are excellent too. Once the fish have been located and seem to be confident in eating your chosen bait off the surface, it’s time to try presenting a baited hook to them. Use as light a set-up as is practical for the conditions being fished and the size of the carp that can be seen. A 12' rod with a 2 to 2.5LB test curve is ample but if stalking the carp through bushes and bramble is necessary, a shorter, 9' rod should be considered. Don't forget the landing net, a protective mat, and the camera phone etc. before leaving base camp to go stalking, it's easily done. If we are lucky enough to find the Carp close to shore, in the margins, a sheltered area, close to reeds, floating lilies or protective over hanging trees, very often a free-lined bread crust is the best and most rewarding way to go. Use a nice subtle mono or fluorocarbon main line in the 6 to 10 lbs. bs range, go heavier if the conditions being fished demand it. Use a size 8 or 6 hook securely anchored into a piece of crusty loaf or Bagel. After hooking, quickly dip the bread into the water before casting as this will add a little casting weight to the bait. Try and cast past the visible fish so you don't disturb them and gently draw the baited hook back towards the feeding fish. Make sure the reel's clutch is properly set! If free lining a bait to them isn't practical, one of the 3 surface rigs pictured below will help us do the job. When the carp are a little further out from the margins, making a free lined bait tricky or impossible to cast to them, using a controller float is the next approach to use. There are many permutations and versions of this float by many different manufacturers but in general, as can be seen in the most basic and yet still 'fish safe' surface rig #1 diagram above, controller floats are typically self-weighted and either lay flat on the surface or as depicted in the above diagram, sit up in the water so the line passes through the eye located at the top of the float. 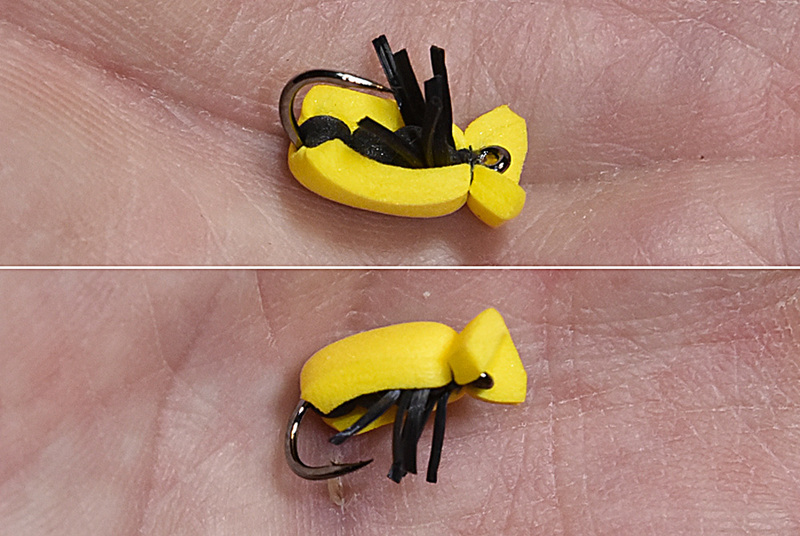 This eye at the top of the float lifts a few inches of line up out of the water on both sides of the float and this in turn makes seeing or detecting a bite so much easier. Easier? Well because our hook-bait is in the middle of plenty of 'free' bait offerings also floating on the surface, it is very easy, especially at some distance to lose track of which bait is the actually hook-bait. When we suspect, the carp has taken our hook-bait; by keeping a close eye on the controller float as the carp moves off with the bait, we will first see the float bob, quickly followed by the line visibly tighten through the float and actually lift up off the surface of the water. Of course, if we see the actual hook-bait get slurped up by a feeding carp, one can confidently strike even before the float moves. By repeatedly and gently mending (pulling up the slack and straightening the line) any bowed line laying on the water's surface that maybe caused by a slight current or a blowing wind, we keep our strike as efficient & effective as possible, thus increasing our overall hook-up ratio. This will save much time in encouraging the carp to start feeding confidently again after a lost fish has swirled and bolted in a panic, spooking the rest of the shoal. This version of the surface rig is the 'problem solver' to fishing at distance in shallow waters with a floating bait. This time using a bubble float that freely slides on a ledger link line (paternoster) with a lead weight tied to the bottom of it. The bubble float rises up the ledger link and supports the swivel and the mainline running through it just under the surface (1 to 2 feet below the surface). The buoyant bait then rises to the surface to temp the carp. Tighten just enough to sink your mainline, maybe with the rod tip just in or very close the the surface of the water. Again checking to ensure that the reel's drag is properly set before also engaging the bait runner/free-running feature is engaged if using this type of reel. Stay right next to the rod . 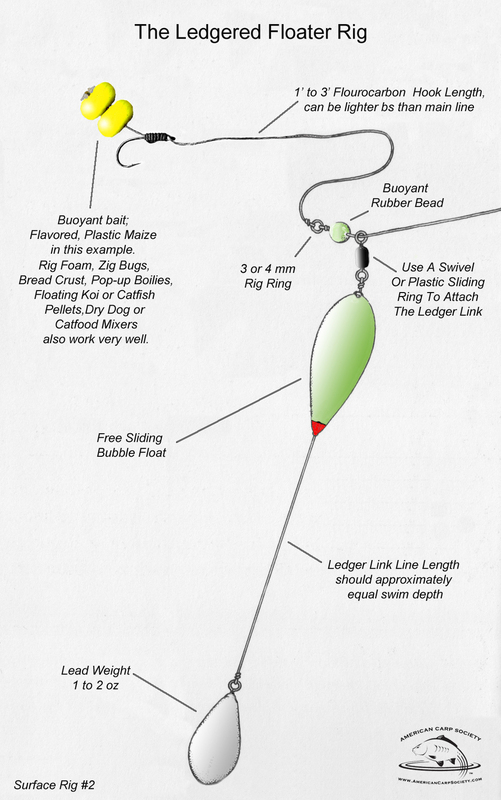 When a fish slurps in the hook-bait, turns and moves off, the mainline gets pulled and runs through the swivel that is located above the ledger link line/sliding bubble float and activates the bite alarm or whatever bite indicator (hanging bobber, washing up liquid bottle top, monkey climber, folded aluminum paper weight etc.) we are using, dragging line from the reel and indicates a bite. Strike! As a very useful option, we suggest placing the lead weight inside a PVA bag and filling it with free floating baits that will rise to the surface once the PVA has dissolved. Also, try licking & folding a dissolvable PVA nugget on the hook to help prevent tangles during the cast. Used for presenting floating baits in any depth of water. The first thing we might notice about this version of a surface fishing rig is the fact that it is set up very similarly to a marker float rig! 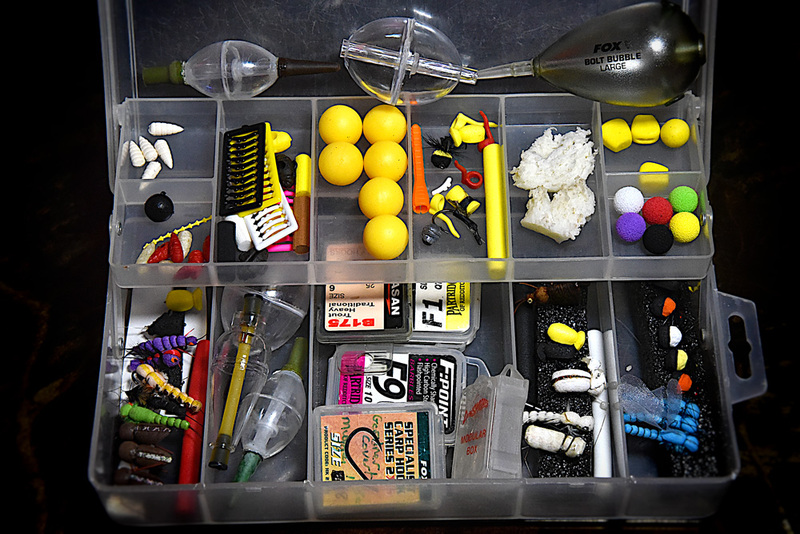 Check it out if you're not familiar with a marker float rig. 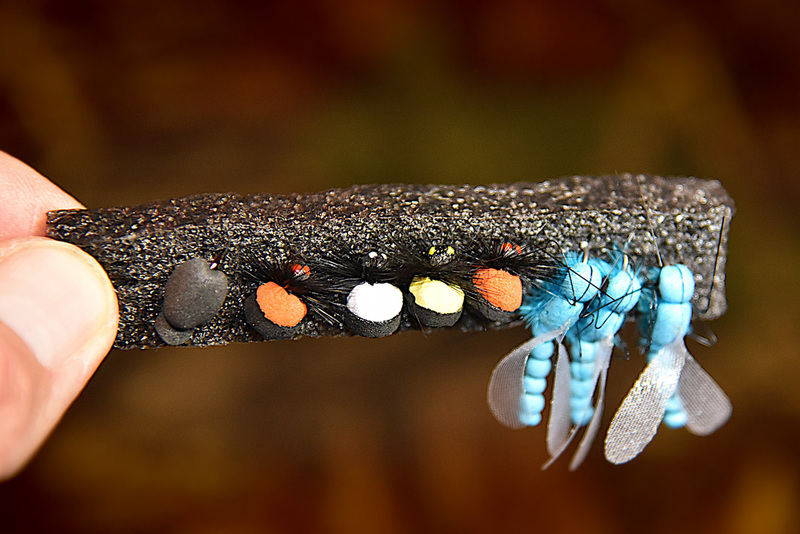 The beauty of this is in the fact that it allows you to present a buoyant bait to feeding carp at almost any depth. Fishing action can be very depth specific, the carp may be cruising at the mid-way point but not at the surface or near the bottom. A difference of a couple of feet may make all the different between getting a bite or not. This may be since the Thermocline is well up and established or maybe that the air pressures have been fluctuating crazily between hot winds and flat, mirror calm conditions or even blinding, bright sunlight beating down on the lake, warming it up and lowering the oxygen content in the water. All these factors and many more, either individually or in varying combinations in different sections of the same lake on any day will affect the carp's feeding behavior bringing them up in the water columns for long periods of the day. Experimentation with experience is the key. This is where the Adjustable Zig Rig comes into its own; we can now search the lake for the feeding fish not only on a horizontal plane across the bottom & surface layers but also now on a vertical plane, up and down in the water column! We suggest casting the rig out and letting both the buoyant bait and the bubble float slowly rise to the surface before placing the rod onto the rod holder (pod or bank stick arrangement). Then carefully reel the line in until the bubble float submerges, the baited hook will still be floating. We can try leaving it there for a period to see if there are any carp interested in feeding up on the top. Then wind in until the bait is approximately a foot under the surface, we can gauge this by keeping an eye on the amount of line that is reeled back onto the reel, physically put a finger on the line about a foot from the reel and reel in until that section of line is back on the spool. If after a period, say 20 or 30 minutes there is no response or action from the fish, try winding in another foot, repeat until you either get a bite or you've wound all the line in and the rig is being dragged along the bottom. Then try raising the Zig Rig back up into the layers a foot or two at a time. It takes patience but very often, the fish will be found and it's always a nice surprise to get a screaming run and to catch a fish up in the water column. Something that would probably not have happened if we'd been sat there all day with a bait on the bottom! To reduce the chances of a tangle during the cast, place a PVA nugget onto the hook & bait. 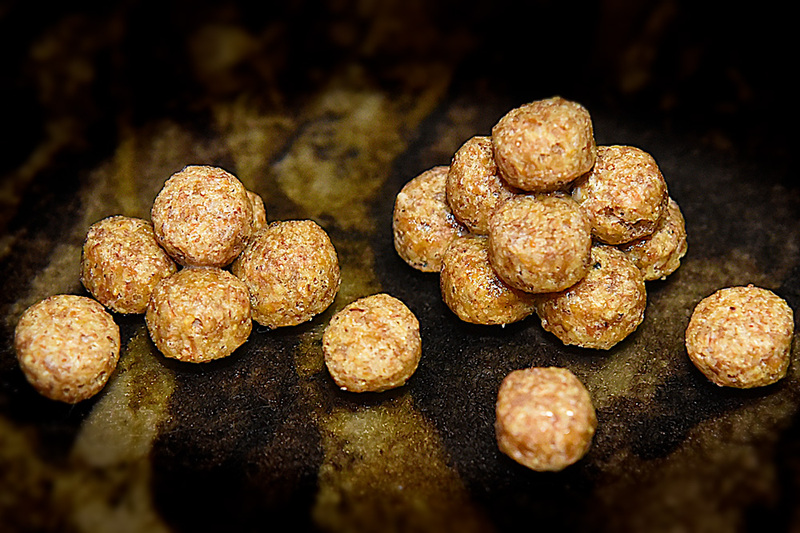 Place the lead weight into a solid PVA bag with a combination of ground bait and floating baits for attraction purposes. A pack bait/method mix could always be used around the lead weight with the hook-link carefully coiled inside. A tricky process but once mastered this serves both anti tangle and attraction purposes.